"I love love love LOVE my new weather station"
All works well except for the atomic time. There is no signal showing, let alone having it turn solid. How do I know it is searching when it doesn’t show the signal icon. I have given it 24 hours to find a signal. - Be sure you have good batteries in the forecast station. Hold the SET button to send the forecast station on a signal search at night. Position the forecast station for better reception. Preferably in or near a window with the front or back facing Colorado. Allow up to 5 nights to receive the time signal. This is a nice product. Amazon purchase. Easy to read. Atomic time works great. 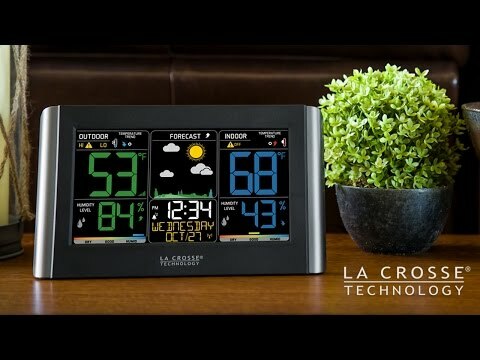 But the outdoor temperature sensor reads between 3 to 7 degrees warmer than the actual temperature. Called for support. Left a message. Not worth the $ if it doesn't work properly. Thank you for contacting our support staff on 1/25/2018. We apologize your temperature sensor was not working as expected and hope the warranty replacement that was sent is meeting your expectations. Please let us know if we can assist further.